Arnaud Guppillotte starts his international youth basketball season preparation with a five-day training camp in Bourges with 16 players in the U18 age group (1995-1996). Guppillotte who was the coach of France U16 last summer (2012) will be assisted by Arnaud Brogniet and Yann Fonteneau during the evaluation. Due to the fact that France will also have to select a U19 team this summer for the FIBA U19 World championship for Women, the French Basketball Federation decided on having an early camp in the form of a try-out for later training camps. At the end of the five days a decision will be made on which players if any join the official France U18 training roster for the next stage of the preparation. 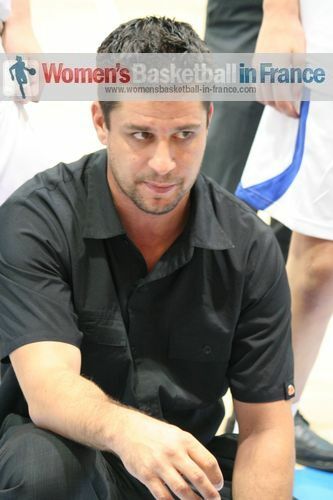 France are the current U18 European Champions and will start the second stage of their international youth basketball preparation in Temple-sur-Lot on 4 July 2013 with at most 24 players in the initial training roster. Out of the 16 players called up for this camp, three players are from the CFBB. two players come from LF2 while the rest come from the various basketball academies of teams in the LFB. The 16 player selected are as follows: Brenda Agblemagnon (1.83, 1995, Arras), Camille Cirgue (1.85, 1996, CFBB), Katia Clanet (1.89, 1996, CFBB), Mathilde Combes (1.83, 1996, Bourges Basket), Louise Dambach (1.76, 1996, Illkirch-Graffenstaden), Sophia Elenga (1.85, 1995, Bourges Basket), Mégane Hero (1.67, 1995, Lattes-Montpellier), Ophélie Irabe (1.83, 1995, USO Mondeville), Marine Johannes (1.77, 1995, USO Mondeville), Alexia Lacaule (1.60, 1995, Basket Landes), Joanne Lauvergne (1.90, 1996, Bourges Basket), Clémence Lefebvre (1.85, 1995, USO Mondeville), Marie Mane (1.82, 1995, Bourges Basket), Marie-Michelle Milapie (1.93, 1996, CFBB), Lisa Millavet (1.85, 1995, USO Mondeville), Julie Paget-Sentagne (1.83, 1995, Illkirch-Graffenstaden), Margot Vidal Geneve (1.63, 1995, Hainaut Basket).